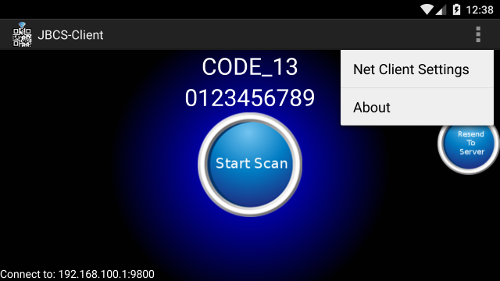 The JBCS-client is an Android application that scans barcodes and sends the result to a server. This application is dependent on the Zxing project. This project is responsible for scanning the barcode. Once the barcode has been scanned, the JBCS-client collect the result. 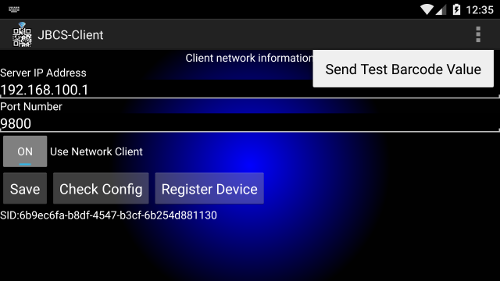 The JBCS-client also has a network client built in. By configuring this client, the application can transmit the result over the network to the JBCS-server. Lastly, The client can be registered with the server allowing device restriction with the server. The IP address the JBCS-server is listening on. The port number the JBCS-server is listening on. The device registration is a feature that can be enforced by the JBCS-server. If this feature is enforced, The JBCS-client will need to be registered with the server. On the other hand, if this feature is not enforced, the JBCS-client may be able to send it's barcode values to the server with out being registered. 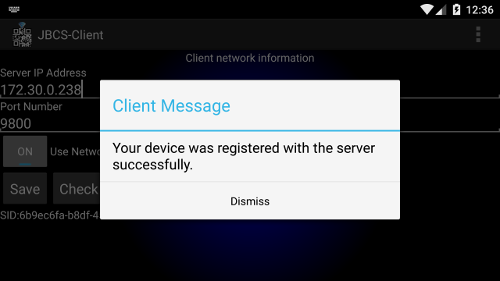 Lastly, The client will notify the user if this feature is enforced on the server, and let the user know that they must register the device first.